User experience improvements, new Radio Paradise stations, and support for various hardware features among the highlights. BluOS users will now be able to identify high resolution tracks when browsing Qobuz content within the BluOS Controller app. An “HR” icon will appear next to hi-res tracks, keeping the experience of browsing through Qobuz content similar to that of browsing through content from Tidal or other music services. Improvements have also been made to the BluOS integration with Roon to improve compatibility with Roon’s recent version 1.6 release. A number of refinements and additions have been made to BluOS’s hardware integrations. All BluOS users will now be able to rename inputs to custom identifiers or hide inputs not in use to reduce user confusion of available audio sources. Bluesound users will experience better Bluetooth pairing stability, while users of the NAD Masters M10 BluOS Streaming Amplifier will now be able to easily pair their Bluetooth devices with NFC. Additionally for M10 users, Dirac Live will be enabled and includes in-app room correction controls once the technology has been configured by the user. Chassis firmware to support DTS:X on NAD Electronics AVRs using the AM230 and AM17 MDC Modules will be bundled in with the BluOS update for the convenience of users with BluOS Enabled AVRs. Users of non-BluOS Enabled AVRs with those MDC Modules should contact their dealers to obtain the DTS:X firmware update or visit NADelectronics.com for a do-it-yourself download and installation of the update. BluOS 3.4 will also include a number of music updates, including three new Radio Paradise stations, which like the existing Radio Paradise integration, will be a no-cost service bundled in with BluOS Enabled products. The new Radio Paradise stations will feature lossless CD quality streams for Mellow Mix, Rock Mix, and Groovy Mix, and users will now have the option to skip songs. Additionally, after users “like” 100 songs in any of the Radio Paradise stations, an additional station of “My Favorites” will appear in the menu, essentially creating a custom radio station. BluOS users will be able to stream or download live concert recordings – many of them in lossless formats – with nugs.net, the latest music service to be added to the ever-growing list of streaming integration partners. The new features and upgrades of BluOS 3.4 will be on demonstration at the AXPONA Expo, April 12 to 14, 2019, Renaissance Schaumburg Hotel and Convention Center in Chicago, IL. 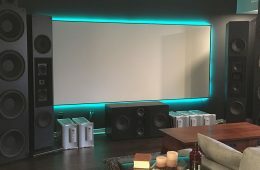 Visitors to Holm Audio suite #726 and Saturday Audio Exchange suite #306 will have the opportunity to experience BluOS on some of the latest products from NAD Electronics and Bluesound, as well as take advantage of various show promotions. BluOS™ is a premium multi-room audio ecosystem that manages stored and cloud music sources and playback, with support for high-resolution audio streams up to 24/192. Adopted by some of the most renowned hifi audio brands and integrated with numerous smart home control systems, BluOS allows for interoperability among enabled devices across brands for maximum versatility and use cases. Integrations with popular streaming music services like Tidal, Spotify, Amazon Music, Sound Machine, and Deezer, as well as featuring support for FLAC, WAV, MQA, and other high-resolution formats and codecs, BluOS offers virtually unlimited access to music of all genres for residential and commercial projects. Made up of an operating system and a control application for smart phones, tablets, and PC desktops, BluOS is the ultimate choice for modern distributed audio solutions.